Somebody, somewhen, triggers Article 50. The UK, which ceased to exist for half of us on the night of Thursday June 23 (our variation on the Beer-Hall Putsch) falls into the hands of the nationalist nasties, unopposed by any effective opposition, with attitudes hardened by intransigent statements by some European heads of state. Scotland has its second independence referendum and, with a new-found willingness by the EU to negotiate, fast-tracks into Europe and swans off to do its own thing, preferably taking Northern Ireland and Gibraltar with it. In the process, its revenues are buoyed by a massive influx of corporate relocations and the welcomed migration of skilled professionals. After a bumpy ride, it thrives on continued access to the EU markets and from a more pluralistic democracy. It even, after some false starts, manages to distance itself from the yoke of dysfunctional British bureaucracies. The rump UK is less lucky: riven by social divide, political infighting and the burden of having to renegotiate pretty much everything with the rest of the world, it rapidly falls out of the top ten of world economies and becomes regarded by the rest of the planet as a rather backward theme park, visited to watch the quaint inhabitants take tea on the vicarage lawn and indulge in the traditional pastime of immigrant-blaming. We don’t have a written constitution and we don’t have precedent for this. So we have to make it up as we go along. There are multiple legal challenges to enacting a referendum outcome without either a constitution-changing majority or the explicit consent of Parliament (which has primacy in the UK, not the government of the day). The poison chalice of Article 50 is repeatedly kicked into touch, supported by those EU governments who understand that this isn’t really about them – Angela Merkel understands this and needs to ensure that Hollande et al take a breath and step back for a while. At home, both Labour and Conservative parties disintegrate, leaving a much more Eurostyle centrist alliance – albeit initially grudging – of the old Tory ‘left’, the Labour ‘right’ (who have far more in common with each other than they do with the outer wings of their own current parties), the SNP and the Lib Dems. New parties form, merge, split and reform, it being very difficult to manage a multi-party state under first-past-the-post voting. Maybe we should have a referendum on that. In the meantime, the EU, under huge pressure from nationalist and populist movements across the mainland, takes a enforced and hard look at itself, choosing to become less focussed on political integration and more on flexibility and adaptability, engendering a rather looser federation of states who still however subscribe to the fundamental principles and values of the union. 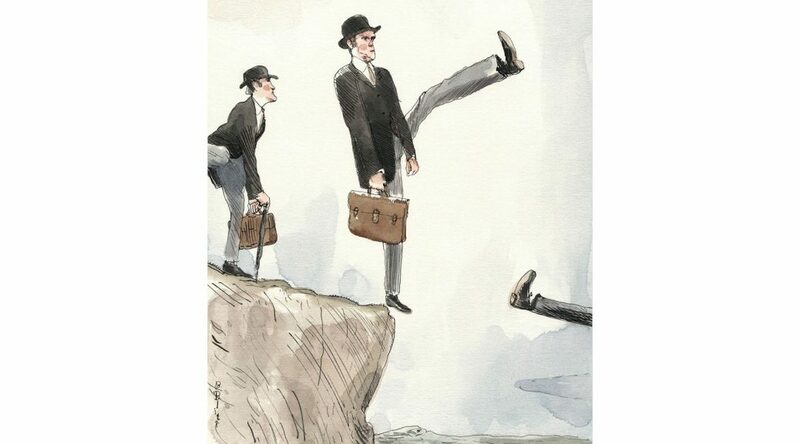 At some point along the way, flexibility and change on both sides creates enough of a fudge for the Westminster government of the moment and the EU to be able to claim a result and abandon further attempts to depart. At that point of course, we’re left with the Great Dissatisfied of the Leavers and it will then be the work of a determined generation or two of education and opportunity to bridge that socio-economic divide to the point where people can actually make informed choices. We’ll know that’s succeeded when the Daily Mail goes out of business. Scotland, in the meantime, has been getting its ducks lined up and ready to play either scenario whilst being seen as the voice of reason within and on behalf of the local union. Whatever happens, it likely comes out of it with greater self-determination and an enhanced reputation as a modern, progressive nation. Whether’s it’s richer or poorer as a result remains to be seen. If however it were to jump too precipitately into a play for independence, that might still backfire, to everyone’s detriment: judgement and timing are all-important here. The title image here is the brilliant current cover of the New Yorker magazine, by Barry Blitt.